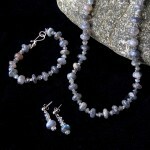 I had finished stringing the necklace in this set and needed a break. 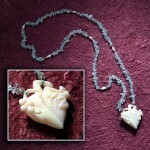 So I laid it down in a tray that held an Amazonite necklace till I could finish adding its clasp. When I returned and saw how the serene blue-green stones elevated the otherwise ordinary necklace to a statement of classic beauty, I started all over again, deciding how many and where to add them. I began with quite a few and eliminated them two by two. The melon-shape of the large central plastic bead is echoed in the clear round ones, but their striping of 24K Gold meant I needed to use gold elsewhere, even if it was now selling for $1400 per ounce. I believe it was the right choice to use them. 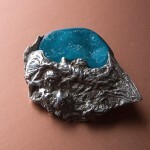 And see how the clasp repeats the melon motif. 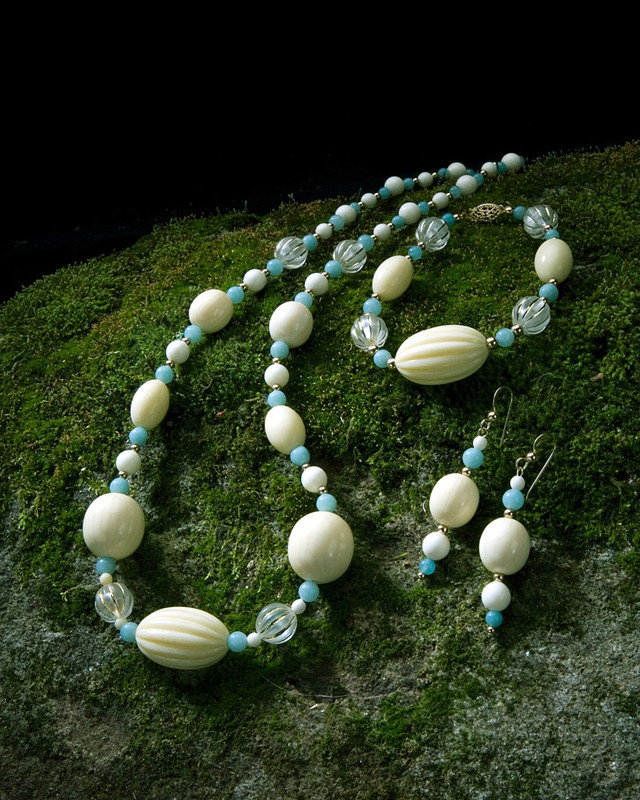 Even the honeydew melon color of the Amazonite and the faint markings on the ivory beads tie the design together. 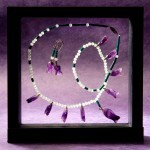 I very seldom use beads other than semi-precious gemstones and have committed to always disclose when they are not. This design began with the four faintly striped beads which had been given me some years ago by an elderly friend. They were heavier than the obviously plastic beads described above and had what appear to be growth rings, which true Ivory would exhibit. I have priced this set as if it contained Ivory, however if whoever purchases it can tell me how to determine that it doesn’t, I will gladly take $100 off the price.